Nelson has lost most of its links with the wooden hulled scows that used to take produce around the bay and across the strait to Wellington. While the old boats have gone, there are still old salts who remember those times. One of them is Buzz Falconer, well known for his involvement in the Challenger Scallop Enhancement and the annual Blessing of the Fishing Fleet. Around the turn of the 19th century Buzz's grandfather, Frank Falconer, had his finger in several Golden Bay pies. He owned a farm at Waitapu (near the Globe Hotel - now the River Inn), a picture theatre in Takaka (now the Wholemeal Café) and he set up dairy factories in the Aorere Valley. 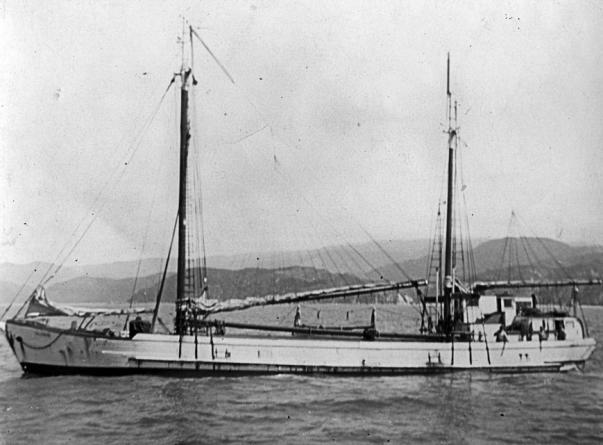 The TS Talisman was built at Lanes Yard, Whangaroa, in Northland (see comment of 26/6/2011), a hub of wooden ship building in the 1890s. Frank brought her down from Auckland early in the 1900s and began shipping freight - mainly butter in boxes - from Golden Bay to Wellington. Buzz's father bought the family business in 1941, and Buzz's memories go back to his childhood days, when he'd watch on the wharf as live pigs were lifted on board ‘squeaking like hell with a 'snotter'- a sling tied under their middles. The pigs were shipped direct to the Hutton's factory at Petone. Buzz Senior used to climb a windmill tower on the farm and watch the scow until it had crossed the Waitapu bar. "Then he'd ring the Petone factory and tell them what time we'd be in - about 15 or 16 hours later," Buzz recalls. "One day he fell off the tower and broke his ankle. I had to pick up my speed to milk nine cows before school." The Talisman had a crew of seven who would load Golden Bay cargo on Friday and spend the weekend in Nelson, unless there was a deck cargo of pigs. They'd leave on Sunday afternoon with the Pearl Kasper, Portland, Paroto, Wakanui and the Te Aroha, which, as the fastest scow in the fleet left a little later. Buzz took his first trip across Cook Strait when he was 14 and can still remember the southerly roll against the tide off Terawhiti, ‘wondering how the old girl was going to get across the big swells'. In the waterfront strike of 1951 he left college to help crew on the Talisman, which was called into service by the navy to help move the backlog of cargo between Picton and Wellington. Buzz then did his time at the Anchor Shipping Company, emerging five years later as an engineer, serving on various ships, setting up Marine and General Engineering and making a career change to the fishing industry in 1971. He made many trips on the Talisman and recalls the camaraderie of the back bar at Wellington's Post Office Hotel where the ‘wooden hullers' used to gather after unloading their scows - this on top of the 16 hour trip. Buzz also recalls a time when boys were taken on straight from school and learnt a respect for the sea, along with the skills they would need to navigate when the only aids were ‘inside the skippers head', though the Talisman also had an ex-army ZC1 radio that ‘would go when it was in the mood'. The Talisman was powered by two diesel motors in Buzz's time, but the old mainsail would also go up if the wind was fair, to help boost speed. "We worked hard and played hard," Buzz says. "Many of the people who worked on the old scows went on to be captains in later life." Have clear memories of crewing on Talisman 19:49 50 and of waterfront strike.Clear memories of Talismans last voyage under sail from Wellington to Lyttelton. Believe I am the last surviving member of the then crew. Irish engineer said, "Put this in your memory boy because it will never happen again." Fresh N.E. and a bone in her teeth. Ashby, T. (1975) Phantom fleet: The scows and scowmen of Auckland. Wellington: Reed. Mackay, D. (2004). Voices from the sea: The stories of some Nelson and Marlborough fishing families. Motueka, N.Z: Talley's Group. Moore, B. (1990). Shaping up and--shipping out: The last years of the Nelson Harbour Board \. Nelson, N. Z: Published by Port Nelson Ltd. under contract to the Board. Storage barge to be removed (1999, February 27) Nelson Mail p. 5.